One of the big highlights of 2011 on June 7th when a friend and I headed out storm chasing in pursuit of a cell over Lough Neagh when suddenly we abandoned that plan when a stunning black sky of heavy clouds rolled down towards us from Glenshane Pass so we pulled onto the hard shoulder and watched as that approaching thunderstorm forced another cell up ahead of it on it's outflow boundary which then began rotating like mad, then from the base of this rotating cell dropped an impressive black funnel cloud which twisted over the green fields near Glenshane Road over the direction of Knockloughrim. The funnel lowered and rose several times while rotating and came close to touching down over the fields while thunder rumbled and hail stones began to fall, the experience was truly spectacular and filled with excitement and awe. The following day we went knocking on doors in the area in search of witnesses and found several however none could confirm seeing ground contact and no damage was found. 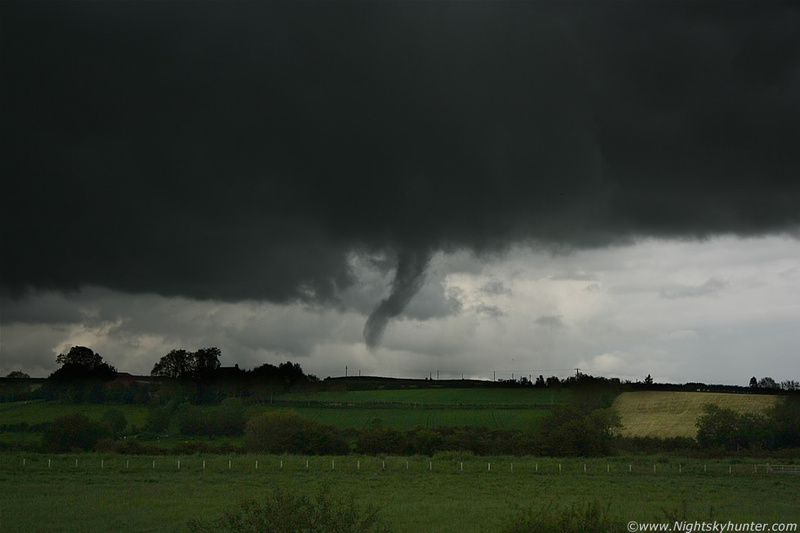 Definitely within my top three favourite funnel encounters and a fantastic chase day, read the report for more information. * All images are available for sale in the form of photo prints, canvas or digital files for licensing, if you are interested in a purchase simply drop me an email.